Donald Trump's 2018 fiscal budget proposal for the federal government, which was announced in May, notably aims to slash funding for Medicaid, the EPA, food stamp programs, scientific research, and cultural agencies. Of the 66 programs up to be eliminated or cut, the ones that allocate funding for arts and culture are the Corporation for Public Broadcasting, the Institute of Museum and Library Services, the National Endowment for the Humanities, and the National Endowment for the Arts. The funds that each agency will ultimately get for federal programs will be decided by members of the House and Senate appropriations committees. While it isn't certain that federal support for the arts is doomed, all of the discussion surrounding saving federal arts and cultural agencies has provided the opportunity to examine how Rochester's arts scene is funded. It's important to note how little the US invests in the arts to begin with when compared to other developed nations. In 2017, the NEA received just $150 million from the total federal budget of $4.147 trillion. And a 2014 article from Alternet cites the National Arts Index and other sources to show that in arts spending the US falls behind many other nations, including Germany, which dedicated $1.63 billion (in USD) to its cultural budget in 2013. Ireland, France, Sweden, Australia, Finland, England, Uzbekistan, Mexico, and The Balkans also dedicate more substantial support to the arts than the US does. The NEA's own report, "How the United States Funds the Arts," shows that of the revenue sources for not-for-profit performing arts groups and museums, nationwide, only 1.2 percent came from federal funds. Larger sources of revenue come from state and local funding, foundations, endowments and interest, and corporate funding. 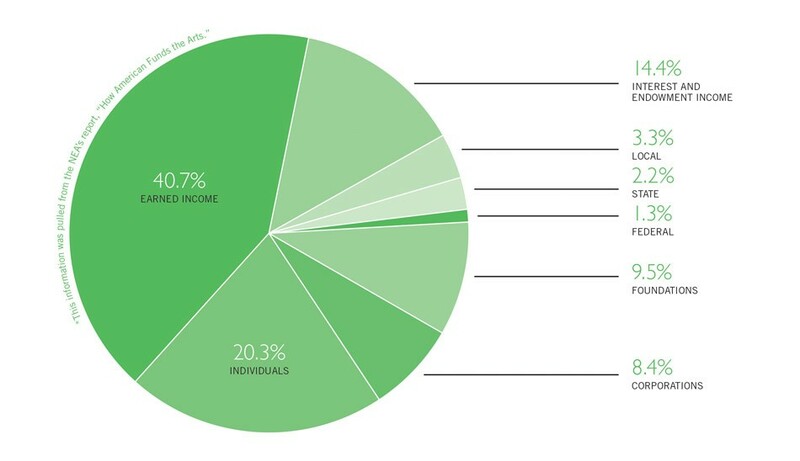 But the largest percentages of income are sourced from individual supporters (20.3 percent) and earned income (40.7 percent). It's also worth mentioning that a city's arts scene is made up of more than just museums, institutions, and well-established arts groups. Individual artists in America are largely on their own, with few supported by federal, state, or local funds. Instead, they must count on individual patrons who purchase their work or go to their gigs. Meanwhile, Sweden uses public money to support institutions as well as punk rock and indie bands, and Uzbekistan notably funds projects by young creatives and pays the salaries of professional artists. When it comes to Rochester's cultural sector, the loss of federal funding would have a varied impact. There is a trickle-down effect to consider: about 40 percent of the NEA's funds annually goes to support state and regional arts agencies nationwide. In 2016 this included $750,000 awarded to the New York State Council on the Arts, which that year awarded more than $41 million to arts and cultural institutions statewide. NYSCA this year awarded $1.1 million to arts and cultural institutions in Monroe County alone and more than $40 million statewide. Because federal funds are scant and acquiring them is competitive, they aren't a significant direct source of funding for Rochester's art scene. But some institutions do rely on NEA grants for support of specific projects. In December 2016, the George Eastman Museum received a $20,000 grant from the NEA, which will support preservation of two 35mm nitrate films from the 1910's: "The Rich and the Poor" (1911) and "The Inevitable Retribution" (1915). Pegasus Early Music in June announced it was awarded a $10,000 Art Works Opera Program grant from the NEA in support of its upcoming baroque opera production, "Dido and Aeneas." "This was somewhat of a surprise for us," says Deborah Fox, Pegasus Early Music artistic director. "I had heard that first time applicants are almost never awarded grants, so I applied without any expectations." Pegasus was founded in 2005, and the grant is its first federal support. The grant covers just about 6 percent of the $175,000 opera budget. "Nevertheless, it is still a significant amount of money, which will go towards production costs and artist fees," she says. "I am thrilled, excited, and grateful to have it, and proud to be recognized by the NEA; it feels like a validation and recognition on a national level of what we do." Fox says that Pegasus was encouraged to apply to the NEA again in the next cycle, which hints that the agency thinks it will be sticking around. Chris Garland, Memorial Art Gallery assistant director of advancement, says that federal agencies don't really provide operating support anymore. Former Speaker of the House Newt Gingrich and his crew killed that about 20 years ago, she says, but the federal government remains a source of funding for special projects. Garland says that the MAG has been supported by federal grants recently for collection management projects. The Memorial Art Gallery in 2009 received federal funding through the Institute of Museum and Library Services in support of the renovation and improvement of its fiber and tapestry storage facilities. The funds also supported the restoration of some of the MAG collection's tapestries. 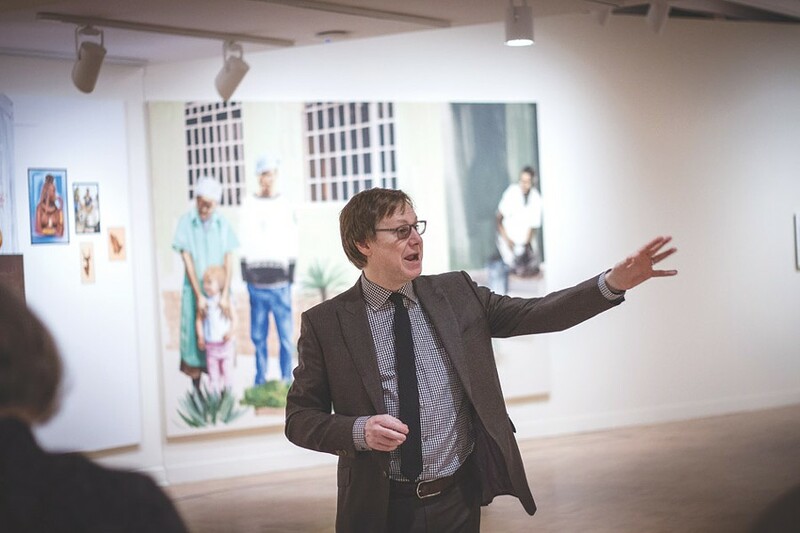 MAG Director Jonathan Binstock says that in-house organized shows, rather than rented exhibitions, are the kinds eligible for federal grants. "They represent new work; they represent an effort to generate knowledge about art and culture and society," he says. "Organizations that do original work such as this -- research and so forth -- have access to the kinds of grants that support research and original work." The last MAG exhibition to receive federal support was its George Bellows show in 2002, which the museum organized and travelled. "We've received some support in the meantime for significant reinstallations of our permanent collection, but not for special exhibitions," Garland says. If the NEA survives, the MAG could see more federal support for shows; Binstock has committed the institution to organizing more in-house shows -- like its recent Meleko Mokgosi exhibit. The timing of the proposed budget cuts isn't great for the MAG, he says, "because a lot of our programming is now geared toward being able to apply for those grants. And if it all comes to pass and there's fewer grant dollars for us to apply for, then we'll have to find other ways to pay for the programs that we're organizing." A further complication, Garland says, is that the federal grants MAG applies for require a one-to-one match, "so they're very important in leveraging local support and support from the institution itself. They also serve as a stamp of approval -- that what you're doing is good. It's very prestigious to win. They focus on your scholarship and service to your community, they're peer-reviewed, so they're really important things to get." While other cities of comparable size rely on corporate support of the arts, Garland says that Rochester can't count on the same. Corporate funding in Rochester has taken a real hit. The MAG "used to get $55,000 a year from Kodak, unrestricted, and it was even higher than that, I think, way back when," she says. "Gleason used to give us $30,000 a year. Bausch and Lomb, Xerox -- all of those big funders were good for five-figure gifts, unrestricted, every year, and then some of them would also do exhibition support for us. And that's really pretty much dried up." Binstock says that support from banks, such as M&T and KeyBank, has started to fill in the gaps, but hasn't reached the levels of arts support that Rochester enjoyed under its now-diminished industry titans. It has fallen to -- and will continue to fall to -- individuals to pick up that slack, he says. The Memorial Art Gallery's 2015-16 fiscal year revenue chart shows that only 2 percent of its funding came from government sources; 8 percent came from the UR, 31 percent from endowments, 26 percent from memberships and gifts, and 33 percent from earned income. "Our credit lines are almost all individuals now, or foundations that are controlled by individuals," Garland says. MAG Director Jonathan Binstock at the gallery’s Meleko Mokgosi exhibit. Individual support for the arts remains crucial nationwide. A Giving USA report estimates that annual private charitable donations to arts, culture, and humanities causes totaled $17 billion in 2015. This number dwarfs the federal millions allocated for the same sectors, and some who are opposed to federal support of the arts argue that the relatively small federal contribution is unnecessary. A local example: in December 2016, Edgar Smith and Lusette "Andy" Smith, University of Rochester 1972 graduates, committed $5 million to establish the Ed and Andy Smith Endowed Funds for the Performing Arts. The money will support performing arts programming within the UR's School of Arts and Sciences, and also provide seed funding for the proposed construction of a new studio theater on the River Campus. "There's precious little that's been funded at the Flower City Arts Center through federal funding," says Janice Gouldthorpe, the center's director. "The things that we've been able to fund are largely programmatic. Our youth photography program is the only thing we've had federal funding for in the past. We've gotten no general operating support, no capital support, no support for any other programs." In the 18 years that the youth photography program has been running, it has received federal support four times. "We have probably spent well over $360,000 to produce that program," Gouldthorpe says. "Federal funds in that time have been maybe $40,000." So if the federal cuts go through, Gouldthorpe doesn't anticipate much change for Flower City. "We would be looking to individual supporters, family foundations, and some national foundations," she says. "The ability to position Rochester and this center as a resource regionally and nationally, allows us to tap into funding from outside of this area. And bringing in those outside dollars will allow us to keep operating the program. "That's the trajectory we're on anyway, we don't count on federal funding, ever. The competition is so high and the dollars are so meager." Nevertheless, Gouldthorpe says supporters of the arts should get in touch with their representatives. "People think, 'Oh, but I'm just one person,' but you would be shocked at how much a single person writing an eloquent letter about the importance of the arts can do," she says. "Congress people and senators often don't take time to do general research on what the demand, impact, and benefit of the arts is, so your anecdotal information to them is key." As federal funds are already so skimpy, Gouldthorpe says that arts organizations and artists rely heavily on the support of individuals. Many arts projects are finding funds through crowdsourcing, including on platforms like Indiegogo and Kickstarter, and now those methods far outstrip federal funding. And it's not just the arts. Gouldthrope says that anyone working for a nonprofit will tell you the majority of the funding comes from individual donors. "Your $20 donation, when you add that up across the spectrum of the millions of people in the United States, that money far outstrips what our federal government is doing," she says. "Or what foundational giving or corporate giving is. People might think, 'I'm only one person,' but that aspect of the funding stream is critical and substantial." The MAG is increasingly looking to individuals beyond Rochester to support case-by-case programming, Binstock says. Part of his role as director is building these relationships and generating support and enthusiasm around specific projects. "They do this because they're interested in the particular subject or the artist that we're showing," he says. "Wendell Castle has collectors in New York City and D.C., for instance, who have helped us pay for our Wendell Castle show that's coming up." Because the MAG is an encyclopedic museum with a broad purview, it can think strategically about the intended audience for a given exhibition. "Whether it's an audience of visitors or an audience of funders, is really the game now and the game going forward," Binstock says. Museums are also becoming more retail-oriented in how they approach their programming. Beyond just charging admission to see the collections or special exhibitions, they are generating additional income by hosting more and more one-off events -- especially ones that appeal to younger visitors who don't become members at the rate other generations have. Several other local arts and cultural institutions have taken up a trend of offering 21-and-older events to supplement their funds. Rochester Contemporary Art Center's "Art of the Mix" series are exclusive cocktail parties featuring mixologists from local, upscale eateries. The Strong's "The Happiest Hour" features adult beverages, a dance party, and the run of the museum sans children. And the Rochester Museum and Science Center's themed "RMSC After Dark" programs similarly let adults explore the museum and socialize without competing with kids. In the past year, the MAG has hosted several, often holiday-themed events and series, including "Museum of the Dead," "Cocktails with Creatives," and "Valentine Schmalentine." "You have to constantly give folks a reason to visit," Binstock says. "It's not just about raising money, it's about creating programs that are sale-able and then expecting people to buy them. The intensity of the need to do that is what's changing, and the less funding there is, the more we have to think of ourselves as a retail operation." Less funding changes the playing field, because it forces cultural institutions to compete with commercial and for-profit institutions for those luxury, recreational dollars, Binstock says. "But we're not competing with Geva or the Eastman Museum or The Strong or the RPO," he says. "We're competing with Radio Social, with Good Luck -- I love going to those places. But we're also competing with Netflix or Amazon Prime." And, "the mall," he dryly adds. When there's less funding for the arts, for scholarship, for unique experiences that are unlike any other in the cultural-commercial landscape, Binstock says, "we have to find other ways to compete for the dollars that visitors have in their pockets to spend. The trick is to remain true to your mission while wrestling with Netflix, the mall, or bowling, because we're not about to put a bowling alley in the gallery. We're here for the art." Flower City Arts Center Director Janice Gouldthrope. There's another crucial task individuals can take up, Gouldthrope says. 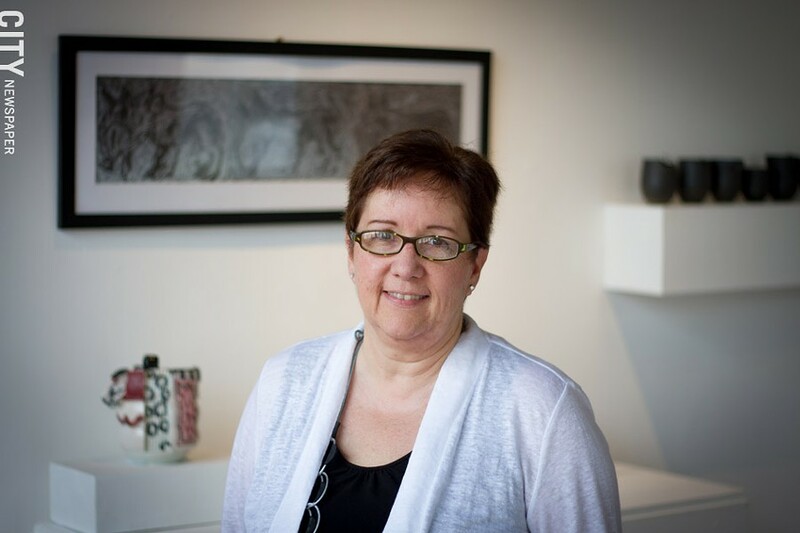 "On the local level, people can work with local government and legislative groups to put together structures to support the arts here," she says, "whether it's at the Monroe County level, or at the City of Rochester level." Both the county and city say that they support the arts, but Gouldthorpe believes there has been little action to back that up. "Mayor Lovely Warren has been known to proclaim that Rochester is 'The city of the arts,'" she says, "but there is no structure in the government that really coalesces that into a strategic framework." Gouldthorpe sees the need for a funding framework that allows the city to work with other outside entities, whether they be foundational or corporate resources. There's been talk in the past, she says, but nothing has been implemented to the city governmental structure that makes that into a reality. It's the same in the county government, she says. "It matters who is elected to office, and they need to know that there is a portion of the citizens of Rochester and Monroe County to whom art matters," she says. "That needs to be a priority just as does public security and safety, the roads, health, and anything else that happens." Gouldthorpe proposes the creation of a cultural executive at the city or the county level, as well as "a department whose function would be to advocate for, administer, and help coalesce resources." This department would work to get national organizations to invest in this region. "What's currently happening here in Rochester is, more or less, every organization for themselves," she says. It can be noted that in some cities and regions, nonprofit arts councils fulfill some of the responsibilities Gouldthorpe is advocating for. The Arts & Cultural Council for Greater Rochester was founded in 1980, and has served as an umbrella organization that advocates for the arts across 10 counties. It also functioned as a conduit for state and private grants to reach regional artists and small cultural organizations. But the council slipped into financial crisis in 2014 and lost its role as conduit in 2016. It will offer grants opportunities again later this year. Gouldthorpe cites cities with United Arts Funds (UAFs) -- localized arts agencies dedicated to raising money from regional individuals, businesses, and foundations to regrant to local arts institutions -- as success stories. Some exemplary cases, include ArtsFund in Seattle (with more than $4 million in campaign revenue for 2015), ArtsWave in Cincinnati (more than $12 million), and Fund for the Arts in Louisville (more than $8 million). "How did that happen? Over the course of many years," Gouldthorpe says, "but it also happened because they decided to put in place a structure that funds the arts in a more broad sense rather than having arts organizations jockey for position for themselves individually. Cities and communities that have invested that amount of resource to setting themselves up to have a thriving arts sector -- that's very forward thinking. Hope is not a plan. A plan is a plan." 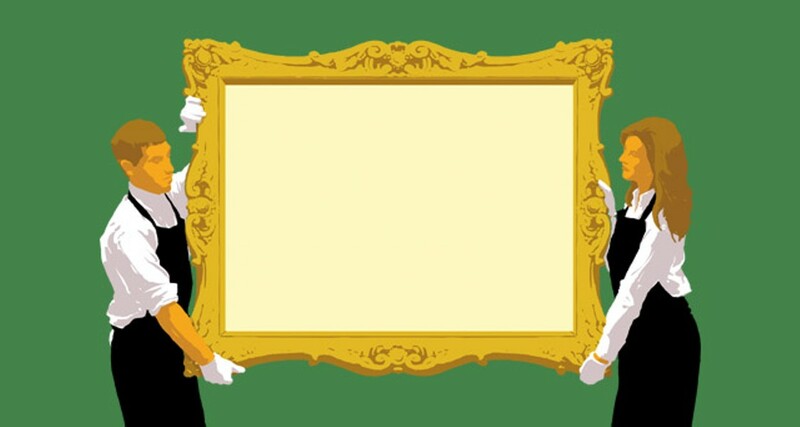 A cultural executive and an arts-forward focus could serve not only established institutions, but also individual artists -- few of whom receive grants or support, despite being the bones and blood of the scene. It's important for a city that bills itself as an arts hub to have structure and support for growing artists in the city, not just performing arts or exhibitions, but as a space that supports its working artists. "Until this community really makes strides in that area, it's going to be difficult to really put us on the map," Gouldthorpe says. "Despite what people say. And just taking credit for what's happening here doesn't mean that what's happening now is going to continue to happen in the future."